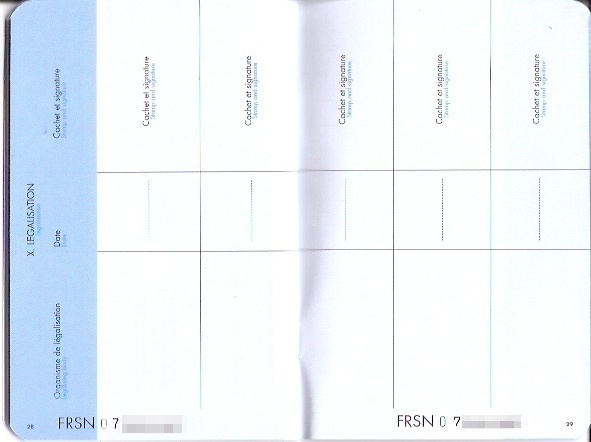 In an earlier post, I shared with you scans of the paperwork Chloe needed to enter France with us (which included the health certificate mentioned above; a copy of Chloe’s current rabies vaccination certificate; and a statement that Chloe’s microchip was implanted on X date, and that Chloe’s rabies vaccine was given subsequent to that implantation, on Y date). We ensured that we had the current versions of the forms by getting them from the USDA/APHIS site, we worked with our vet to get them filled out correctly, and I drove them to our local USDA office to be endorsed. I guarded the resulting packet as carefully as I did my own passport, and made a couple of color copies in case some official wanted to keep a set. As on our last trip, no one showed the slightest interest in inspecting Chloe’s papers at CDG, but I was grateful to have them because (1) you know that if I hadn’t, we would have been met by fleets of officials, uniformed and armed to the teeth, demanding her forms in triplicate; and (2) we planned to spend the last week of our vacation in England, and the Chunnel authorities would certainly expect to see paperwork for her, in one form or another. We made two appointments with a veterinarian in Paris (I’ll give you more info about him and another English-speaking Parisian vet in a separate post), one to get Chloe’s pet passport, and the other to get the tapeworm treatment the U.K. requires. On both visits, the vet gave Chloe a general exam — the first one was thorough, like her usual annual exam, and the second (only a couple of weeks later) was more brief. During our first visit, the information in Chloe’s paperwork was transferred to her new pet passport, and the vet made a note that Chloe was in good health. At the end of our second trip, he added notes that Chloe had received her tapeworm treatment, and was still in good health. Information about filling out an E.U. 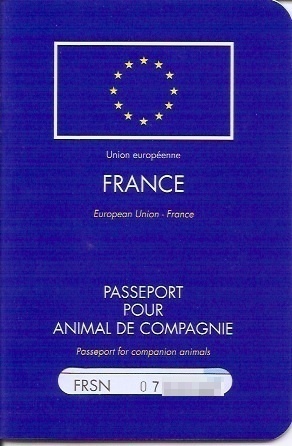 pet passport is provided in this helpful U.K. document. Pages 2-3: Please note that the date of Chloe’s chip implantation is written European-style, with the day preceding the month. I’ve only just now realized that the chip implantation date is wrong. How did I miss that?? It ended up not being an issue (if there had been a problem, you would have heard about it long before now), but I’ll be getting that entry fixed when we next return to Europe. Pp. 4-5, with information about Chloe’s rabies vaccination (including manufacturer, name, and lot number). Pp. 6-9 are the same. What you may not be able to tell from these scans is that the vet used black ink on pp. 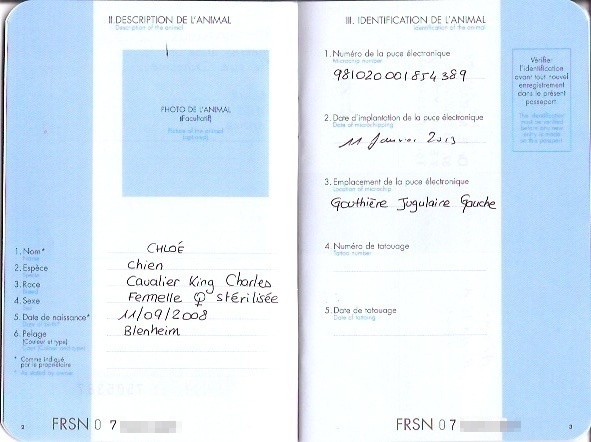 1-3, but his entries on p. 4 and elsewhere in the passport are all made with blue ink, which is a requirement. Pp. 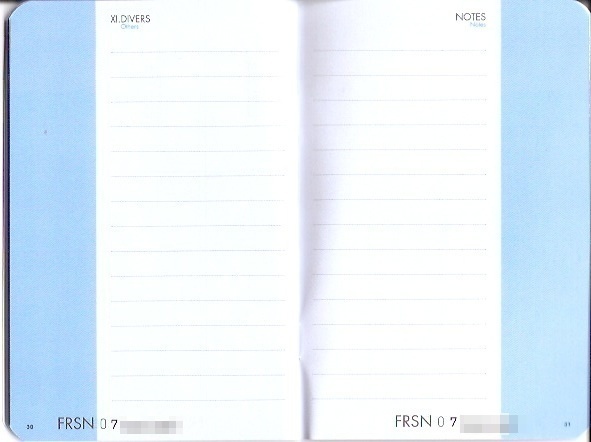 10-11: Not used, since a rabies titer wasn’t required. Pp. 12-13: Not used, because tick treatment was not required. Pp. 14-15 are the same. Page 16: Details about Chloe’s tapeworm treatment. Please note that the time it was administered is included. Pp. 20-21: Places to record other vaccinations. Pp. 22-23 are the same. Pp. 24-25, showing Chloe’s two exams and verifying that she was in good health. Pp. 26-27 are the same. We were very nearly late for our train to England, so I was glad to arrive at the Pet Control Point with a document that didn’t require any explanation. I also enjoyed feeling like a local for a week or two, carrying Chloe’s little blue pet passport in my purse. As I mentioned above, however, it’s not officially the right document for someone in my shoes. 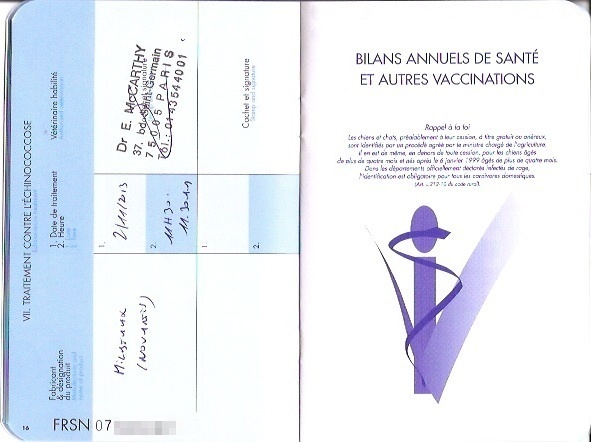 For future trips to Europe, the correct thing to do is gather together the same documents (health certificate and supporting statements from our veterinarian) that we assembled this time. That said, if we plan to visit another E.U. country besides the one we enter initially, I’ll bring the pet passport too (and get it corrected). cat Chunnel dog E.U. 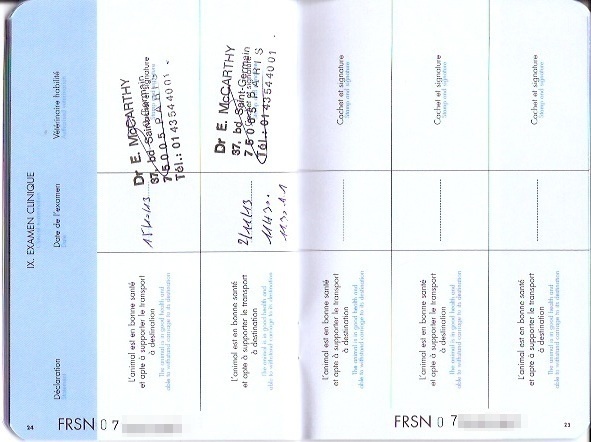 England EU European Union forms France health certificate paperwork Paris passport pet U.K.
We got one too in Bulgaria. It is useful even if not officially the right thing to do. Thanks this information is very helpful. I have a year tourist visa for France and will be traveling around other areas of the EU. I brought my dog and have all the initial paperwork required (health cert, etc.) I had the same experience at CDG. No one asked to see anything. 🙂 Since I will be traveling around EU I was wondering if I should get the EU Pet Passport for Wilson or just use the paperwork I have. However, as you point out it will expire in 4 months at which I guess I have to get the Pet Passport anyway. Thoughts? How much was Pet Passport? Hi, Angela! I would absolutely get the pet passport in your situation — it was not terribly expensive (I’m recalling the 50-60 € range), you’ll need it after 4 months for sure (as you noted), and even in the meantime, it’ll be more readily recognized than your U.S.-based paperwork. What JOY, by the way — have a WONDERFUL time, and please send us pictures!! I hope you are still responding to these posts. We are taking our King Charles to Paris for a little more than a month. We take her to Costa Rica every year, and have some experience, but not for the 32 days we will be in Paris. Do you know what we need (obviously, I will verify, but your experience will help) to return to the U.S.? Will her prior USDA Health certificate ben sufficient, or since it is beyond 30 days, will it expire? I would love to avoid the added cost of having yet another useless examination of our dog in Paris. I know the U.S. checks to make sure that we have the USDA paperwork prior to export. I don’t know what France looks for. Hi, Ryan — Take a look at this post: http://www.dogjaunt.com/posts/bringing-a-pet-into-the-united-states-a-readers-research/ Coming back into the U.S. is pretty straightforward — I believe that the normal proof of rabies inoculation that your vet gives you every time your pet gets her rabies vaccination refreshed would work (assuming that it shows that the current vaccination is still going strong at the date of your return to the U.S.). Just to be on the safe side, you might get your vet to sign it (and date her signature) for you. I am taking my dog to the UK in a few weeks via France. I will be flying into Paris, staying with my grandparents there for a week, and then going to the UK to stay with a friend. I have my vet appointment and USDA appointment, and have a vet in Paris that will give my dog his tapeworm treatment before we head to the UK (since too much time will have passed from his U.S. treatment for that to count). I’m wondering if you know if I can just get documentation of that tapeworm treatment added to my other documents from my vet, or if I should just get a whole pet passport in Paris to be safe. I haven’t been able to find any information about this! Thank you! Hi, Lena — Your French vet will create a document about the tapeworm treatment to add to your existing bundle of documentation. 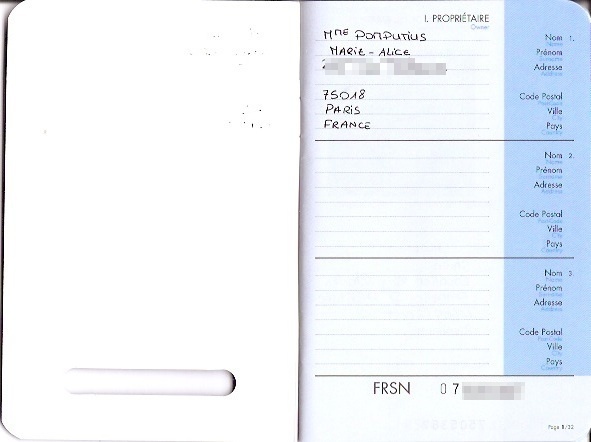 It’s pretty simple to get a pet passport (the French vet will just transfer the crucial info from your documentation to the little blue book — if you go that route, BE SURE that s/he transfers the dates correctly — Chloe’s were transferred incorrectly, I realized only after I returned home, and it was only by chance that the day/month mix-up still worked in her favor, rabies-treatment-timing-wise), and there’s an easy slot in there for the tapeworm treatment to be recorded in. (This reply is a grammatical disaster.) But it’s not required. I got one partly for the sake of the blog, and partly because I thought it might make things smoother at the border for folks to see documents they see every day — but given the date snafu, I could have made things rougher rather than smoother.